The RedHawks, who will be the home team against the Fighting Irish on Sunday, will wear one-game only sweaters that are tan with red trim and prominently feature the beveled “M” on the front. The shoulders of the jersey are red with tan numerals and tan letters for the nameplate on the back while red stripes adorn the sleeves and bottom of the jersey. The Bauer-made jerseys will also have an OfficeMax Hockey City Classic patch on the right side while senior captain Steven Spinell, who modeled the jersey Tuesday, will have his “C” on the left side overtop of a red patch in the shape of the state of Ohio. In addition, Miami will wear tan socks with red stripes to match the jerseys. I really like the Ohio patch and Captain’s “C” embedded with in it. From the looks of it, the back will feature white letters to make them more visible to the far reaching corners of Soldier Field. The weekend’s games will feature 4 ranked teams, as #12 Notre Dame squares off against #3 Miami in the 1 Eastern/noon Central game, and #18 Wisconsin faces #2 Minnesota in the 4:30 Eastern/3:30 Central contest. Having heard from an event official, Miami has sold the most of the 4 ticket allotments given to each school and should have a fantastic presence in the sold out 59,000 seat stadium. You can see the other team’s expected jerseys below. Not surprisingly, Miami is the only of the 3 schools that have announced that won’t be selling these jerseys in the proshop or bookstore any time soon. 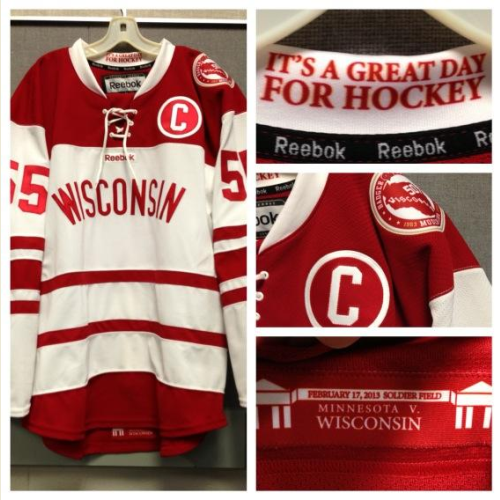 No word yet on if these jerseys will be auctioned off for charity or other purposes. Wisconsin’s throwbacks look simple until you take a look at the detailed image (courtesy of Penn State’s Thank You Terry blog) that shows off some nice special features. Notre Dame also has some nice threads ready for Sunday’s game. From UND.com: “the Irish players will be sporting special jerseys from an era when Notre Dame played all its games outdoors – the club era from 1963 to 1968.” Very cool. Here’s a little better picture as well. Minnesota has revealed their jerseys, and they are less than impressive. Kind of boring comparatively, really. Miami wins the jersey competition. Hands down. 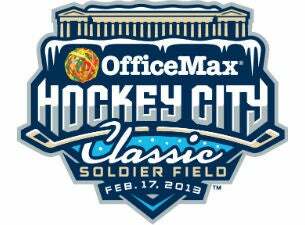 Posted on February 12, 2013, in 2012-13, 2012-13 Weekend Previews, CCHA, Hockey City Classic, Miami RedHawks, NCAA Hockey, Notre Dame, Steven Spinell and tagged CCHA, CCHA Hockey, Hockey City Classic, Miami RedHawks, Minnesota Gophers, NCAA Hcokey, Notre Dame Fighting Irish, WCHA Hockey, Wisconsin Badgers. Bookmark the permalink. Leave a comment.